Background: In psychotherapy research numerous Randomized Controlled Trials (RCTs) have used Waiting-List Control Groups (WLCGs). The focus was primarily on the treatment effects, the results of the WLCGs were used for comparison only. However, the changes occurring in WLCGs are of interest in themselves. They provide information about the effects of waiting for a treatment, which may be, for example, associated with disappointment or hope for improvement. Furthermore, these results may be used as disorder-specific benchmarks for studies not including WLCGs. For these reasons, a meta-analysis on the effects of WLCGs in panic disorder was carried out. Method: A systematic literature search used the following selection criteria: (1) randomized controlled trial, (2) testing an active treatment against a waiting list condition, (3) primary diagnosis of panic disorder, (4) use of reliable and valid outcome measures. Symptoms of panic were used as the primary outcome. Results: The search led to the inclusion of 29 RCTs (n=1899), covering 30 WLCGs and 48 treatment groups. Mean waiting time was 10.05 weeks. In the WLCGs, the pre-post effect size in measures of panic was g=0.10 (95% CI: 0.024-0.180). Effects on other forms of anxiety, depression and psychosocial functioning were g=0.15, g=0.100 and g=0.14. For the active treatments, large withingroup (g=1.09) and between-group effect sizes (g=0.99) in comparison to WLCGs in measures of panic were found. 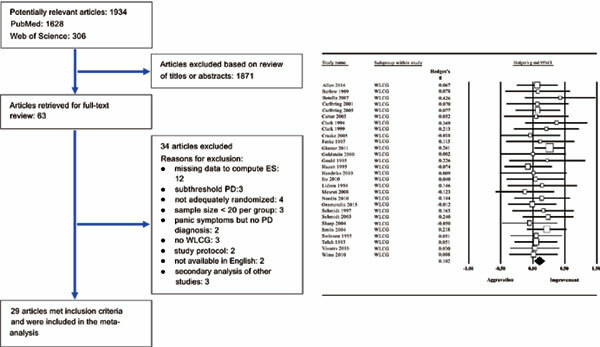 Conclusion: Only small changes in terms of effect sizes occur in patients with PD waiting for treatment in RCTs. Keywords: Panic disorder, waiting-list control groups, effects of waiting, norms of change, benchmarks, meta-analysis. Keywords:Panic disorder, waiting-list control groups, effects of waiting, norms of change, benchmarks, meta-analysis. Abstract:Background: In psychotherapy research numerous Randomized Controlled Trials (RCTs) have used Waiting-List Control Groups (WLCGs). The focus was primarily on the treatment effects, the results of the WLCGs were used for comparison only. However, the changes occurring in WLCGs are of interest in themselves. They provide information about the effects of waiting for a treatment, which may be, for example, associated with disappointment or hope for improvement. Furthermore, these results may be used as disorder-specific benchmarks for studies not including WLCGs. For these reasons, a meta-analysis on the effects of WLCGs in panic disorder was carried out.